Eiger creates parts from STL files. To be able to create a print, users must first import an STL file, then Edit the Part Settings and the Internal Settings, if desired. Eiger only supports .STL file types for import and files should generally be smaller than 20Mb for best results. Navigate to Eiger and sign in. From your Library page, select the "Import STL" button at the top of the screen. Select the part you want to upload into Eiger. Configure any part settings as necessary and save the part. Parts that are imported into Eiger must be saved to appear in your organization's library. 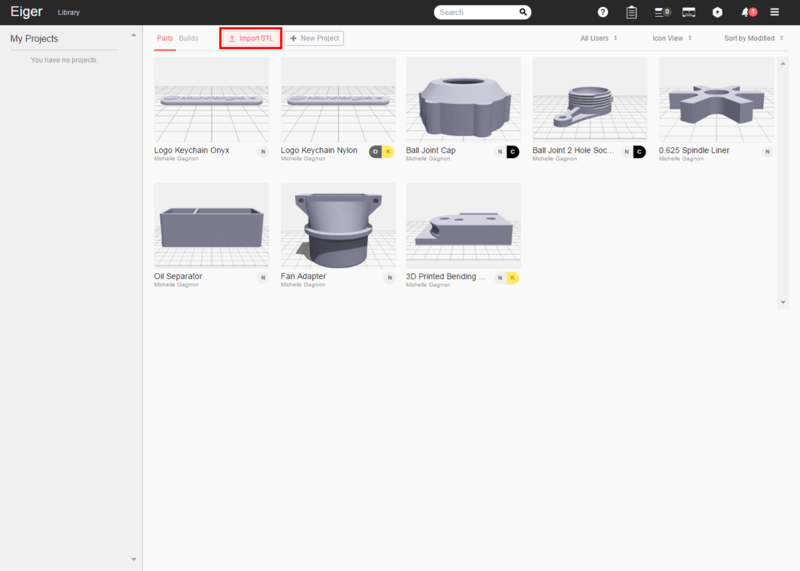 Parts need to be saved in order to be added to a build, shared with Markforged Support, or edited in the internal view. Configure any part settings as needed, including part name or printer model. Note: If you currently have the "Printer Model" set to a printer revision that you don't have registered to your account, you may be prompted with a pop-up notification to register a printer or save anyways. Press the "Save" button in the lower right corner of the screen. Note: If you do not have Cloud Slicing enabled, or if you are slicing from Local Storage Eiger, then the slicing and saving process may pause if the page is minimized. For best success, limit part size to 20Mb or less. Cloning an Eiger part will make a copy of the part with the exact same print settings and configurations as the current revision. When a part is cloned, it is automatically saved into your organization's library. Open the Eiger part you want to clone. Click on the Clone Icon near the upper right corner of the screen. Print the part or make any desired changes and press "Save". At times it may be necessary to reslice a part -- for instance, when a new software release makes changes to Eiger's slicer. Reslicing a part is as simple as selecting a new print material in the Part Settings pane, saving, then reselecting the original material and saving again. In the Part Settings pane of the Part View, select a different material from the Material dropdown menu, then select Save. Reselect the original material from the Material dropdown menu, then select Save. Open the Eiger part you want to update. Click on the Update STL Icon near the upper right corner of the screen. Choose the correct revision of the STL file to upload. Edit the part settings as desired and press "Save". Open the Eiger part that you want to get the STL from. Click on the Download STL Icon near the upper right corner of the screen. Note: Downloading the STL will only give you the file that is used to generate the part in Eiger. It will not include any information about print settings or any configurations that have been programmed in Eiger after importing.